If you have bought any Tecno device and its screen or some part of the phone got damaged accidentally, we have good news for you. Tecno Carlcare centre is a perfect place to get all kind of Tecno phones fixed free when under warranty and for a token when not under the thirteen-month warranty. 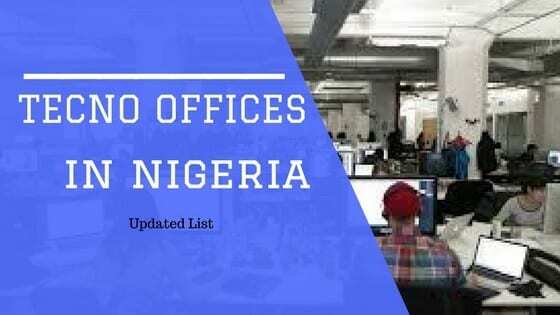 We have compiled a great list for all Tecno smartphone users to locate Tecno Carlcare offices in Nigeria near them whenever the need arises to fix their phones. The warranty period starts at the time of product’s original purchase by the first end-user. The product may consist of several different parts, and different parts may be covered by a different warranty period (from now on “Warranty Period”). Warranty period: Thirteen (12+1) months for the mobile handset. This Limited Warranty does not cover user manuals or any third party software, settings, content, data or links included or downloaded in the product, whether included during instalment, assembly, shipping or any other time in the delivery chain or otherwise and in any way acquired by you. TECNO does not warrant that any TECNO software will meet your requirements, will work in combination with any hardware or software provided by a third party, that the operation of any software will be uninterrupted or error free or that any defects in the software are correctable or will be corrected. c. Defects or damage caused by misuse of the Product, including use that is contrary to the instructions provided by TECNO (e.g. as set out in the Product s user guide). e. Other acts beyond the reasonable control of TECNO. The Limited Warranty does not cover defects or alleged defects caused by the fact that the product was used with, or connected to, any product, accessory, software and/or service not manufactured, or supplied, by TECNO or was used otherwise than for its intended use. Defects can be caused by viruses from your or a third party s unauthorized access to services, other accounts, computer systems or networks. This unauthorized access can take place through hacking, password mining or through a variety of other means. This Limited Warranty does not cover defects caused by the fact that the battery has been short-circuited or by the fact that the seals of the battery enclosure or the cells are broken or show evidence of tampering or by the fact that the battery has been used in equipment other than those for which it has been specified. This Limited Warranty is not enforceable if the Product is opened, modified or repaired by anyone other than an authorized service centre, if it is repaired using unauthorized spare parts or if the Product s serial number, the mobile accessory date code or the IMEI number has been removed, erased, defaced, altered or are illegible in any way and this shall be determined in the sole discretion of TECNO. This Limited Warranty is not enforceable if the Product has been exposed to moisture, to dampness or to extreme thermal or environmental conditions or to rapid changes in such conditions, to corrosion, to oxidation, to spillage of food or liquid or to influence from chemical products. Address: 19, Olowu Street, Ikeja, Lagos. Nigeria. Address 1: 220d, plot 750 Aminu Kano Cresent, Banex Plaza. Abuja. Address 2: 1st Floor, No.16 Gwani Street, off IBB Way, Wuse Zone 4,near King Care Hospital, Abuja, FCT State, Nigeria. Address 1: no. 15 Obakhavbaye street, Oba market road, Benin city, Edo State, Nigeria. Address 2: No.5/7 Isekhere Streen, off Ibewe Road, Ring Road Benin City, Edo State, Nigeria. Address: Isolak Building, Queen Elizabeth Road, Ibadan, Oyo State, Nigeria. Address: 2nd Floor,Ostrich Bakery Building 155 Ibrahim Taiwo Road,ILORIN,KWARA STATE. Address: G5/F6 Ya Ahmed House, on 3rd Floor, Ahmed Bello Way, Kaduna，Nigeria. Address: 1st Floor, No.32, Beirut Road, Kano Contact, Kano State, Nigeria. Address: No.77, Opebi Road, Ikeja, Lagos State, Nigeria. Address: No.55, Kofo, Abayomi Avenue, Apapa, Lagos State, Nigeria. Address: 1205，Ahmodu Ojikutu Street, off Bishop Oluwole Street, Victoria Island, Lagos State, Nigeria. Address 1: No. 13 Okwei street Onitsha. Address:Ground Floor, No.20 Mbonu Ojike street, Ikenegbu, Owerri, Imo, Nigeria. Address 1: No. 290 Aba Road, Port Harcourt. Address 2: 2nd Floor, No.17 Rumuobikani, Trans-amadi Road, Part-Harcourt, River State, Nigeria. Please note Free screen replacement is only valid for first time damage within the 6 months warranty period and do not forget Terms and conditions also apply. Please my canon c8 screen touch is not picking well and the side button is bending. How can I fix them? Please my Tecno L5 Battery Inbuilt connector destroyed, how do if fix it?